This is updated post for long ago blogged post http://eskonr.com/2010/04/sccm-reportcollection-for-computers-with-internet-explorer-with-different-versions/. are you in search of getting summary of IE Versions ,so that you can plan for the migration of Old IE Versions to current version ? Below is the SSRS/SQL report which will help you to get count of IE Versions and total. Note:Replace the quotes with original. SSRS Report attached here. Download the rdl file and upload to your SSRS report folder. 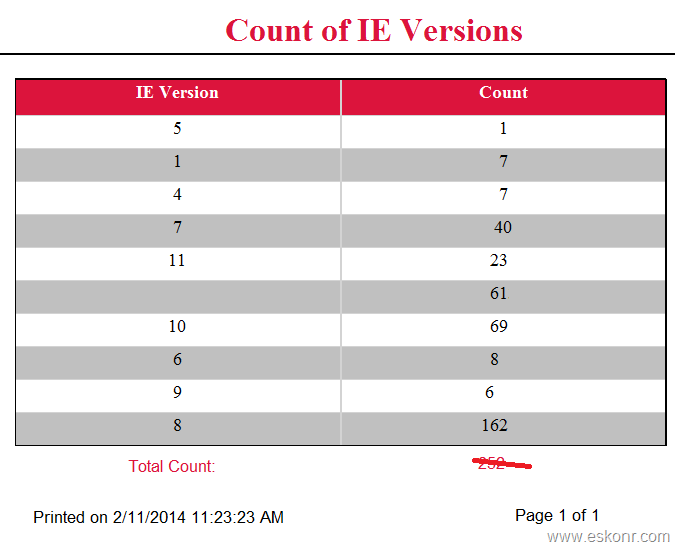 10 Responses to "Configmgr 2012 SSRS Report count of IE Versions"
Hi, I really appreciate your site and your reports! My only thought would be to allow the report to be run against SCCM collections. For instance, I want to run a separate report for workstations than for servers. Basically, the report is the same but provides totals based on the collection (workstations/servers) and not all operating systems grouped together. I have been able to populate the collections but am having difficulty with the count. Any thoughts on how I can do this? Hi, wow quick response! Yes you are right, our admins have created multiple collections so I need the ability to run against different collections. I have been racking my brain very unsuccessfully. Thank you, it is 2012 and I did not realize it was not recommended. I will check out the link asap. I really appreciate your help!! Can add a column as Percentage of this IE versions too ? Does anyone know that only to get the base version but the patch version which states what the latest patch installed on internet exlorer, I have no I idea what table this is in.